Adapted images courtesy of Regensburger M, Huttner HB, Doerfler A, Schwab S, Staykov D. Springerplus. 2014;3:551. [Open access.] PMID: 25332856, PMCID: PMC4192142. Normal urine coloration ranges from clear to yellow. However, a multitude of pathologies and agents can change the color and/or clarity of urine. 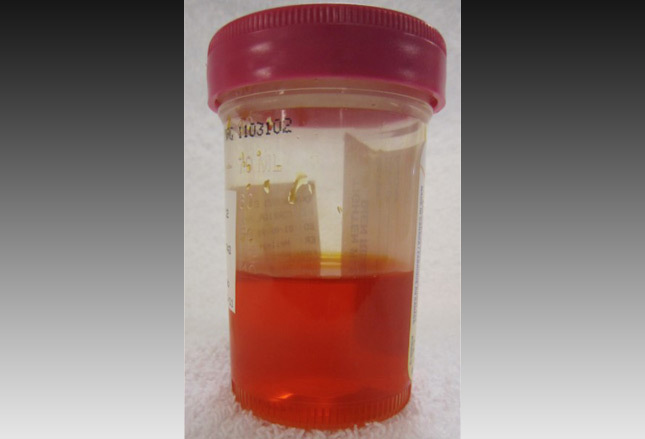 This slideshow discusses several potential causes of abnormal urine color. 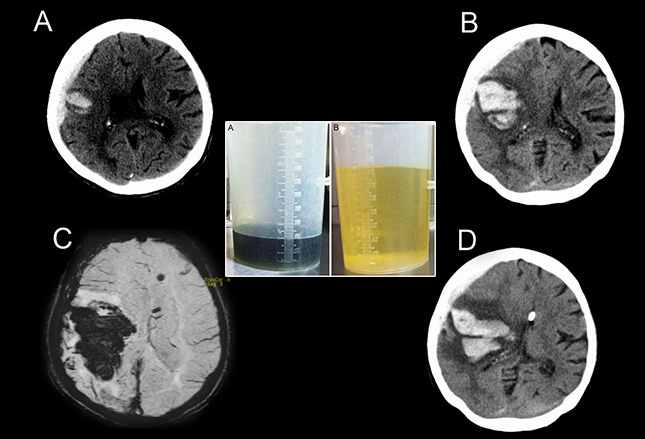 The neurologic imaging studies and urine samples were obtained in an elderly woman who underwent mild hypothermia therapy for an atypical intracerebral hemorrhage. The dark green urine on the center left occurred 48 hours following propofol administration. 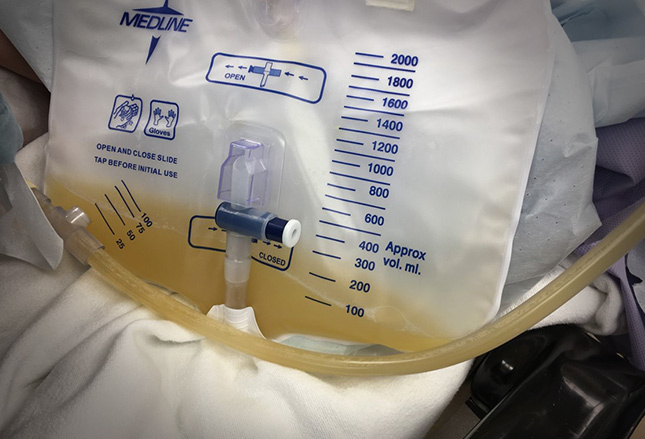 Reversal of the urine color to normal yellow ( center right) occurred a few hours after cessation of the propofol infusion. Image courtesy of Josh Palka, DO. 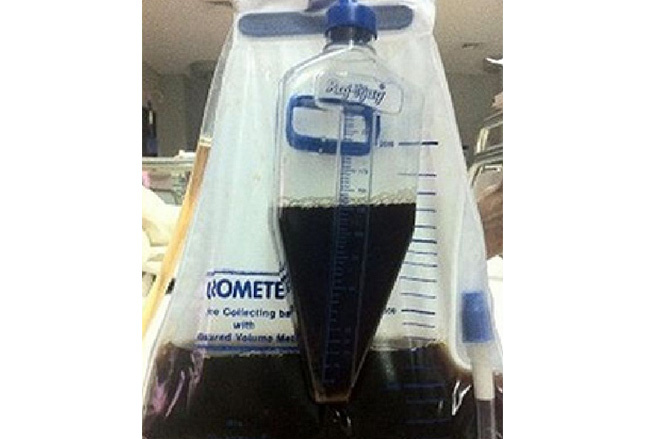 The urine bag shows gross hematuria in an elderly male with a malpositioned Foley catheter. The catheter balloon was found in the prostatic urethra. The image depicts a Foley catheter malpositioned within the prostatic urethra in the same patient discussed in the previous slide. Severe gross hematuria resulted from this placement. Proper insertion of urinary catheters can be challenging in male patients with significantly enlarged prostates. Thus, it is essential to know how to safely insert the catheter into the bladder such that the balloon does not expand within the prostate. When using a Foley catheter, it is important that (1) insertion is to the hub to ensure the balloon is past the prostate and (2) urine return is seen to further ensure the balloon will not be within the urethra when it is inflated. If resistance is met during the insertion of a Foley catheter in a male patient, use of a coude catheter may be attempted as it has a stiffer, angled tip, which allows the catheter to navigate past the enlarged prostate. 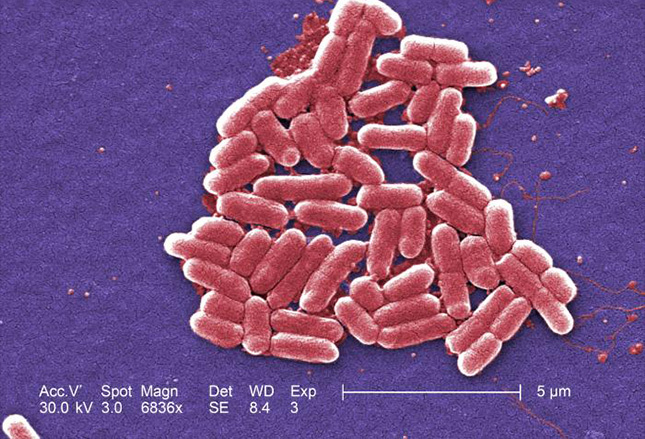 Scanning electron microscopic image of E coli courtesy of the Centers for Disease Control and Prevention/Janice Haney Carr. Another cause of gross hematuria is trauma. Shown is a 67-year-old male who presented to the ER as a pedestrian versus automobile accident. 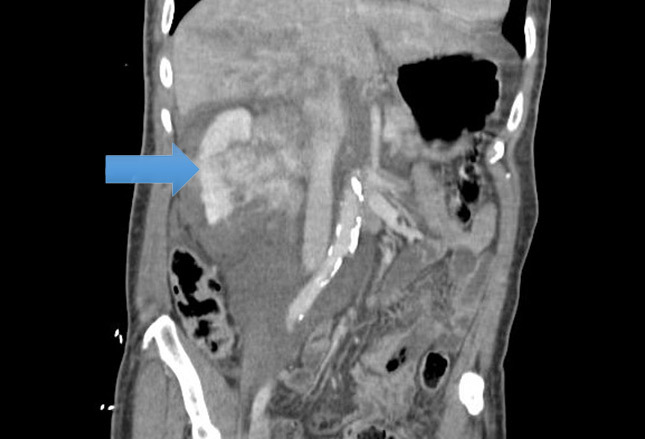 An abdominal and pelvic CT with IV contrast was obtained (after previous images were obtained with contrast) and revealed a right Grade IV renal laceration with laceration through the collecting system and active extravasation from posterior of the right kidney in addition to other polytrauma. The kidney is the genitourinary organ most commonly injured in trauma. Trauma to the kidneys can be managed conservatively and, if needed, angioembolization of the kidney can be performed. Surprisingly, the degree of hematuria does not correlate well with the degree of the trauma. Renal lacerations are graded from one to five, one being the least severe and five being the most severe. Details are listed on the American Association for the Surgery of Trauma website. The patient shown developed a delayed bleed and underwent angiography with selective embolization. Image courtesy of Chris Atalla, DO. 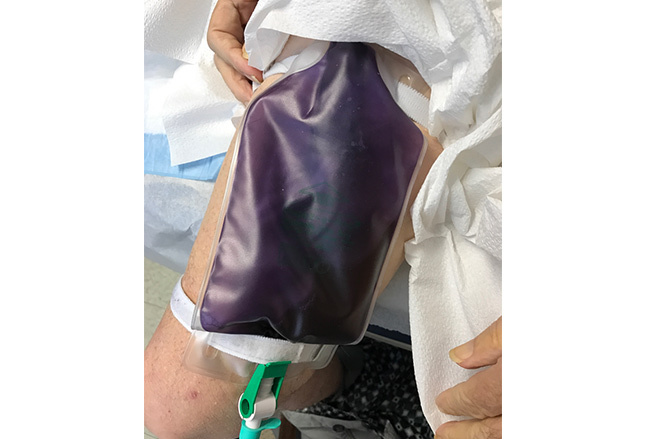 "Purple urine bag syndrome" (PUBS) is a rare phenomenon caused when UTIs with bacterial strains that produce indoxyl phosphatase (eg, Providencia stuartii, P rettgeri, Klebsiella pneumoniae) react with the synthetic materials of urinary catheters/bags. The image reveals bladder cancer found in an elderly former smoker who presented with a four-month history of painless gross hematuria. A major concern for patients with gross hematuria is the possibility of urothelial cancer in the bladder. Globally, urothelial bladder cancer is the 7th most common cancer in men and the 17th most common neoplasm in women. Smoking or a previous history of smoking is the most common risk factor for this disease. Commonly, patients present with complaints of irritative voiding symptoms that may mimic urinary tract infections (e.g., dysuria, hematuria, and urinary frequency) with no growth found on urine cultures. It is imperative that patients be further evaluated with cystoscopy to ensure no underlying malignancy, carcinoma in-situ is commonly missed. Additionally, patients on anticoagulation therapy should be evaluated in similar fashion as those not on anticoagulation therapy as spontaneous hematuria from blood thinners alone should not occur. Delayed CT urogram images were obtained in a middle-aged male with a two-month history of painless gross hematuria. 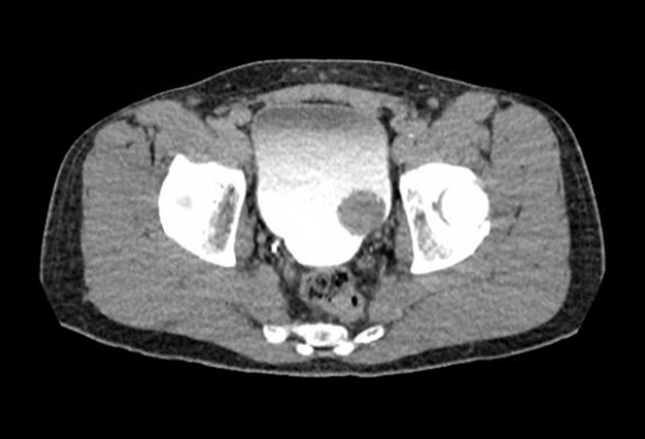 CT scanning revealed a large filling defect in the bladder consistent with a bladder tumor. Cystoscopy demonstrated a large tumor. 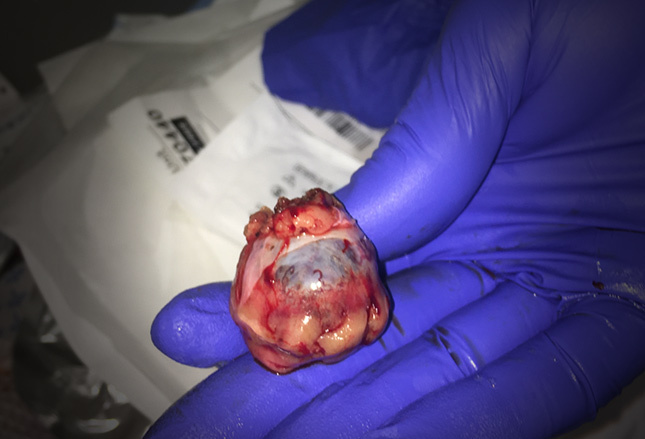 The patient underwent transurethral resection of the bladder tumor and was found to have stage pT1 disease (invasion into the lamina propria). Nephron-sparing surgery has become the treatment of choice for smaller RCC tumors, with one case series showing no local recurrence. However, this type of procedure is more technically difficult to perform and requires the proper selection of patients. The image shows RCC in a young adult female following robot-assisted laparoscopic partial nephrectomy. 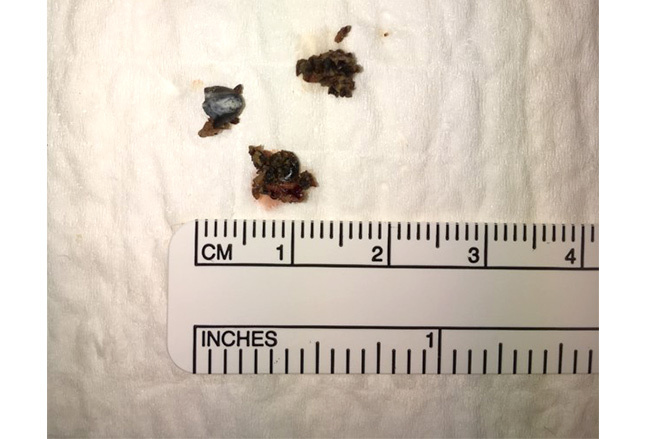 The mass was found on incidental CT scanning for a possible kidney stone. 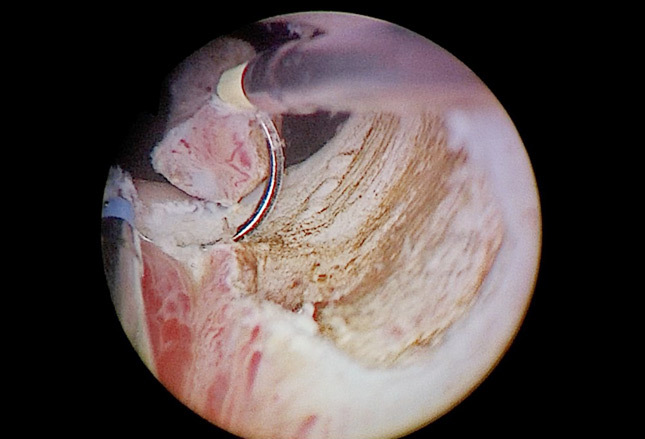 The image shows a TURP operation in progress utilizing a bi-polar loop to remove prostate tissue to open the urethral channel and cauterize any bleeding vessels identified. One frequent dietary cause of nephrolithiasis is diminished or lack of proper fluid intake. [18,19] Another dietary etiology is increased intake of oxalate from foods such as black tea, dark chocolate, rhubarb, spinach, and certain types of nuts. Patients with recurrent kidney stone formation should undergo a metabolic evaluation and 24 hour urine study to elucidate any potential reversible causes of their kidney stones. 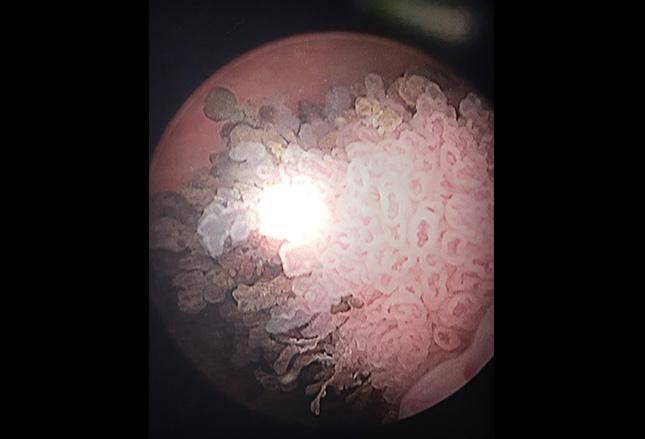 The image shows ureteral stones that were removed with laser lithotripsy from a patient who presented with left flank pain and painless hematuria in the emergency department. Image courtesy of Nunn R, Chang N, Milner SM, Price LA. Eplasty. 2013;13:ic16. [Open access.] PMID: 23409207, PMCID: PMC3558850. Myoglobinuria is usually the result of rhabdomyolysis, typically caused by trauma or alcohol/drug abuse. 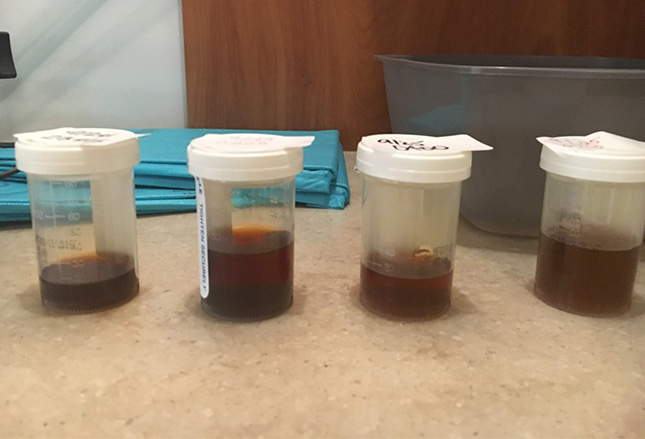 The tea-colored urine that develops is commonly confused with gross hematuria, as both may not only look similar to the untrained eye but also cause positive findings on a urinalysis dipstick. These two conditions can be differentiated by centrifuging the urine. If the urine has a clear center, the cause of the discoloration is myoglobinuria, whereas if there is a reddish sediment, the etiology is likely to be hemoglobinuria. Creatinine kinase levels will also be elevated in myoglobinuria. The image depicts myoglobinuria found in a young adult male following a high-voltage electrical injury that resulted in rhabdomyolysis. 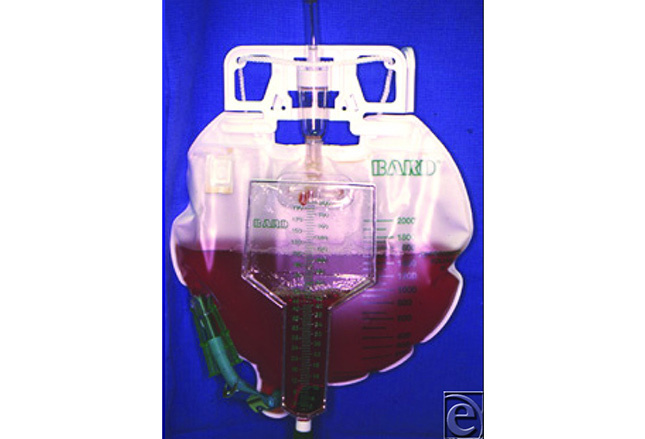 Any patient with a chronic indwelling urinary catheter will have a 100% rate of bacteriuria,  which may develop into pyuria, wherein white blood cells (or pus) are present in the urine. To minimize the risk of infections, urinary catheters and suprapubic catheters should be changed every 3-4 weeks. When possible, bladder emptying should be managed with clean intermittent catheterization to reduce the risk of bacteriuria and infection. 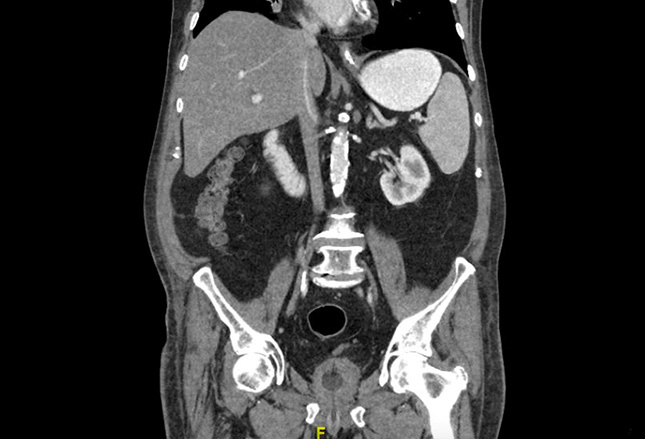 The pyuria shown occurred in a T5 paraplegic man with suprapubic tube in place. As is the case with myoglobinuria, patients with bilirubinuria have a brownish discoloration to their urine  that may be confused for gross hematuria. The bilirubinuria seen in the urine samples were collected from an elderly jaundiced male with autoimmune hepatitis. Image courtesy of Wikimedia Commons/ James Heilman, MD. Phenazopyridine is available as a prescription and over-the-counter medication for the relief of urinary discomfort, burning, and pain—symptoms commonly caused by UTIs. Because this agent is an azo dye, it can cause an orange discoloration of the urine. 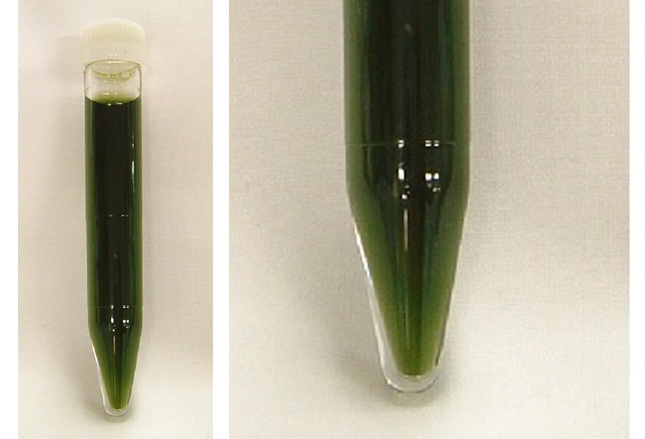 Image of green urine discoloration due to propofol infusion courtesy of Shioya N, Ishibe Y, Shibata S, et al. Case Rep Emerg Med. 2011;2011:242514. [Open access.] PMID: 23326690, PMCID: PMC3542914. 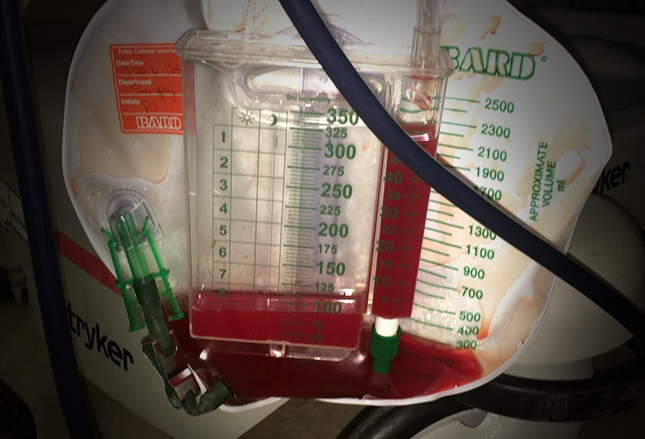 Green urine is a highly uncommon and unusual finding, generally associated with recent surgery requiring high doses of propofol infusion. The discoloration may result from quinol derivatives following glucuroconjugation and excretion of the parent drug. Green urine may also occur with the use of a prescription medication (Uribel) that is similar to phenazopyridine for the relief of urinary discomfort. This medication contains methylene blue and, when mixed with urine, tends to discolor urine green. Adapted image courtesy of Viswanathan S. ISRN Nephrol. 2013;2013:215690. [Open access.] PMID: 24959539, PMCID: PMC4045424. Paraphenylenediamine is a highly toxic ingredient of hair dye formulations that can cause acute kidney injury and result in black urine. The renal damage is likely multifactorial—including direct toxic effects on renal tubular cells, hypovolemia, hemolysis, and rhabdomyolysis—and may require dialysis.